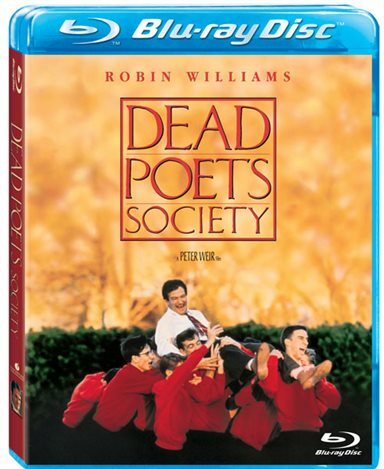 Here's another Robin Williams release that brought him fame during the 1980's called Dead Poets Society. Although Williams does provide some cunning comedy, it's the drama that makes him good in this film. The first time on Blu-ray, this Academy Award Winning film for Best Screenplay looks great on my home theater, a sharp contrast over the DVD. The film centers on a young professor, John Keating (Robin Williams), who gets hired on at a stuffy upscale boy's prep school. The traditional school with all its ceremony, strict rules, special dress code and haughty teachers is not the perfect fit for Keating because of the casual methods he uses. This quickly puts him at odds with the rest of the faculty who disapprove of his unconventional approach. His students however take to him and put Keating on a pedestal. When a tragic event surrounding one of his students happens, Keating finds himself in a difficult position. Williams puts on a great show here with his whimsical style of teaching and the story gets so inspiring it's hard to not like his character, his method and the reaction from his young followers. In support you will recognize the youngsters that have become notable stars in their own right including; Ethan Hawke (Training Day), Robert Sean Leonard (Dr. James Wilson on TV's House), Kurtwood Smith (The father figure in TV's That ‘70s Show) and Josh Charles (Will Gardner in TV's The Good Wife). Direction by Peter Weir (Master and Commander) is very good spooling out his story slowly while capturing his interesting characters and making the film interesting to watch. I lik the way he handles the buildup of the plot showing the importance of every scene especially the relationship between Keating and the main group of boys who take to him in both the classroom and in their private lives. The bonus features are "Dead Poets: A Look Back" featuring interview footage with Director Peter Weir, Ethan Hawke, Robert Sean Leonard and many others; "Raw Takes;" "Master of Sound: Alan Splet" - interviews with David Lynch And Peter Weir; "Cinematography Master Class" – an intensive and inspirational lighting workshop with Cinematographer John Seale; "Audio Commentary" with Director Peter Weir, Cinematographer John Seale and Writer Tom Schulman; and the "Theatrical Trailer." Although I did like the look back at the making of the film and why several of the actors were chosen, not much of the other bonuses were interesting enough to entertain. The film has been rated PG by the MPAA and contains a scene that may be disturbing to youngsters. Download Dead Poets Society from the iTunes Store in Digial HD. For more information about Dead Poets Society visit the FlickDirect Movie Database.